Back when I was in grade school and thought I wanted to be a scientist, I was reasonably obsessed with Stephen Hawking. Every chance I had, I was doing a report or a paper or a poster on him. He was always an inspiration to me not just as a brilliant mind but also as a man who defied the death sentence that his diagnosis with ALS (of recent ice bucket challenge fame) placed on him. 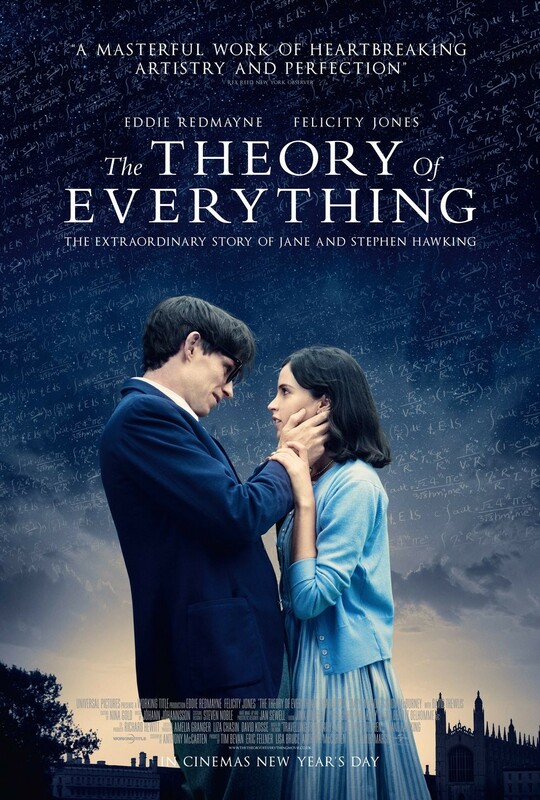 While his story is an impressive one, it alone wouldn’t be enough to carry The Theory of Everything without an equally impressive performance from the man who would try to portray him. As evidenced by the film’s success (both critically and financially), that performance cleanly hit the mark. In 1963, a young Stephen Hawking (Eddie Redmayne) and the lovely Jane Wilde (Felicity Jones) meet at a Cambridge mixer and immediately hit it off. It’s not long before they find themselves in love but their fairytale comes off the rails when Stephen is diagnosed with a debilitating and likely life-ending disease. This devastating development tests their strength and resolve as a couple and, ultimately, whether or not their love can persevere through extreme hardship. As alluded to earlier, an inordinate burden of the film’s hope for success depends on Eddie Redmayne’s performance in the lead role. The praise being heaped on him has been beyond effusive (one of the first reports I heard was that he “IS everything”) and, as a natural skeptic, I had a tough time buying into the hype. But after finally seeing the film, it’s obvious that Redmayne is an undeniable talent. His portrayal of Hawking was spectacular to the point of blurring the line between reality and cinema. I realize that seems possibly hyperbolic, but I know I wasn’t the only person who at times forgot that he was watching an actor perform. Hawking himself wrote that, “At times, I thought he was me”. I couldn’t agree more. Redmayne conducted extensive research with people stricken with ALS and it showed. But it wasn’t just his expert imitation of the body (especially facial) movements of ALS sufferers that was remarkable; he seemed to have found a way to embody Hawking’s spirit and wit. It was simply uncanny and I can’t remember the last time I felt so strongly about a performance. Apologies to Mr. Keaton, but I’d be shocked and disturbed if Redmayne doesn’t walk away with the Oscar for Best Actor (although, it’s hard to ignore one of the cardinal rules of acting that Tropic Thunder taught us [even though it doesn’t apply if we’re being totally honest]). As outstanding as Redmayne was in the film, I’d be remiss if I neglected to mention Felicity Jones’s quietly tormented and sympathetic portrayal of Jane Wilde Hawking. This is a woman who accepted a life of suffering when she had a chance to bail for greener pastures at the beginning of the relationship. She endured and sacrificed for love and family and Jones does an excellent job of balancing the conflicting desires for a more normal, personally fulfilling life with the near-overwhelming devotion and love for her completely dependent husband. Two other performances that stood out were Harry Lloyd’s portrayal of Stephen’s best friend Brian and Charlie Cox’s turn as Jonathan, the choirmaster who Jane eventually develops feelings for. It was a treat for me personally as a longtime admirer of Hawking to see so much of the life I had studied as a pre-teen portrayed so faithfully on the screen. But there’s a reason that more than a bulk of this review discusses the acting of the film. As a biopic, The Theory of Everything rides heavily on the performances of its leads and to the film’s credit, those performances are superb. However, from a pure story as well as cinematic standpoint, it didn’t seem to be doing anything that was particularly noteworthy. It was solid and satisfactory all the way through, but nothing about it (besides the performances) screamed “special” to me. That tends to be a limitation of biopics as a genre and unfortunately, The Theory of Everything doesn’t do enough to transcend.